Wow... We had so many wonderful Assistant Elves this year. 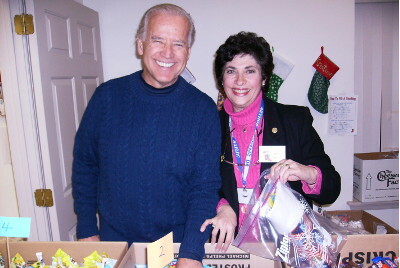 THANK YOU fabulous volunteers who helped us to have such a terrific 15th year of sending our special stockings to our wonderful troops so they will know that the Great Folks in Delaware and all over America are thinking of them. THANKS so much, everyone, for all your donations, contributions, hard work, good will, thoughtfulness, sense of humor and volunteer spirit. We Did It Together. This was our BEST YEAR EVER!!! 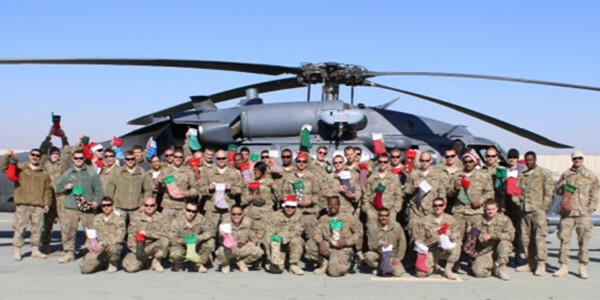 Our 15th Annual "Stockings For Soldiers" community project has sent over 10,000 personalized stockings to our troops. 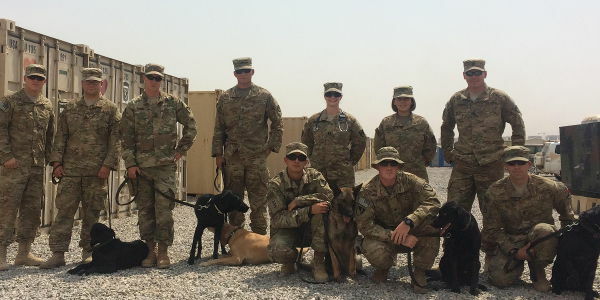 We're so proud to know that so many of our brave members of the military will know how much we respect and appreciate all they are doing for our Great Country. 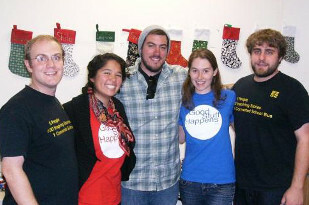 We sent 1,400 boxes, filled with all the great goodies that you all donated for the stockings. 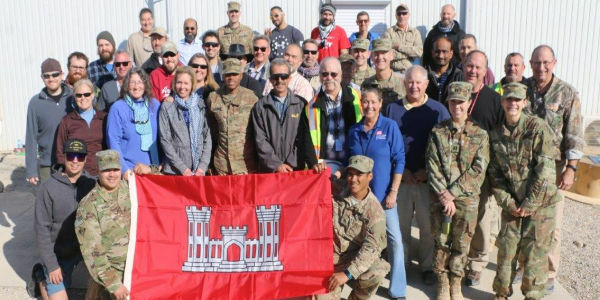 This year, our stockings went to our troops in Afghanistan, Iraq, Jordan, Kuwait, Djibouti, Africa, United Arab Emirates, Poland, Qatar, Abu Dhabi, GITMO in Cuba, South Korea, Japan, Bahrain and parts unknown. We sent to 46 different zip codes and supported 145 different groups who requested our stockings. 1,000 + volunteer elves - sent over 10,000 homemade, personalized Christmas stockings packed in 1,400 boxes that weighed over 45,500 pounds. Our fabulous volunteers came from Delaware, Pennsylvania and surrounding areas, and from ALL over America. 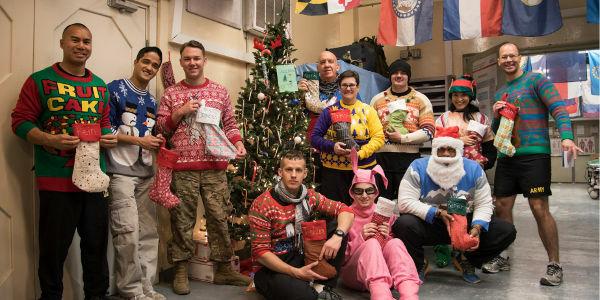 In addition, we sent 2,200 small polar fleece blankets, 7,400 Star Packs, and over 400 knitted hats for our troops. We also sent over 10,000 personal greeting cards and many hundreds of letters of appreciation from children from many, many schools. 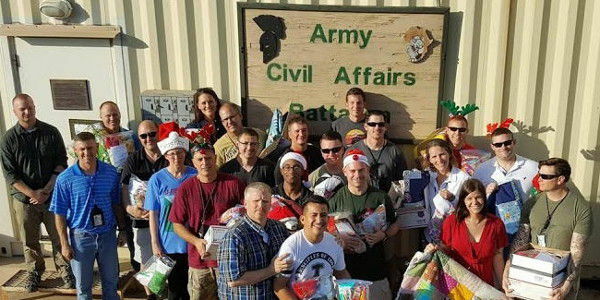 In addition, we donated over 1,000 of our stockings to several Military organizations so our vets could have a festive Christmas celebration this year. Our Stocking project was such a Team Effort. Each and every person has played a very important part in its success. We could not have succeeded without everyone's help. Sincere Thanks go to all our 1,000+ kind and generous local volunteers and our great friends who live far from here, but who have sent us their donations and contributed greatly to the success and completion of this community project. At this time, I would like to mention just a few of our special friends. I appreciate everything that all of you did to work so hard, so quickly, so efficiently and so successfully. 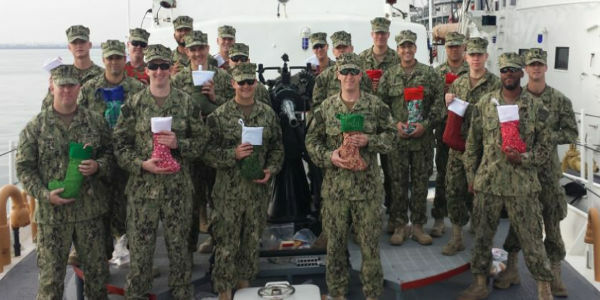 I know our troops are so grateful and will be so happy to receive our Goodies. 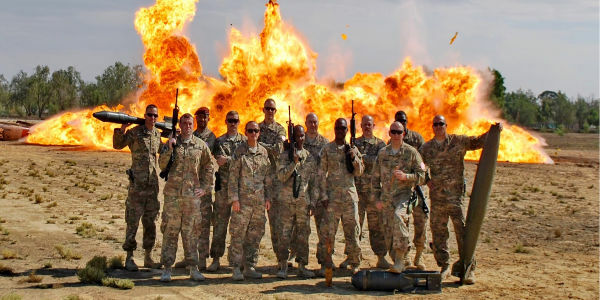 Because of our combined efforts, we will be able to touch the hearts of over Ten Thousand of our most precious young men and women who are bravely serving their country. Please accept our deepest THANKS for each and every donation, contribution and good wish that we received. THANK YOU. Thank You so very much to the generous owners of our new location in the Plaza III Shopping Center: Louis Capano & The Capano Company have been so wonderful to provide a NEW LOCATION for our project. They vound us a new fabulous home and they were so wonderful to do that for us. THANK YOU to Brian K. for taking such good care of us. Thank You to Chris P., owner of Anytime Fitness for donating their furniture to our project. Thank You to our new neighbors, Sarah from the Comic Book Shop, Joanne from Sanctuary Spa, The Goat Restaurant and the Ricciardi Brothers for their patience and kindness. Again, our deep appreciation goes to Louis Capano III, Brian Kohut and Rep. Debbie Hudson, for making it possible for all our volunteers to work in such a fabulous environment. We are so very grateful for their tremendous generosity. Our sincere THANKS go to the wonderful Chesapeake Bay Area Girl Scouts and our Boy Scout volunteers. These terrific leaders have been so important to us because they are teaching their Scouts the importance of volunteering. Their enthusiasm, helpfulness and hard work are so much appreciated. 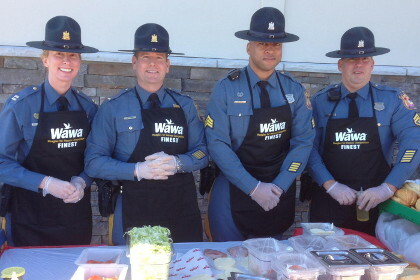 Our sincere THANKS go to the wonderful Volunteer Delaware 50+ organization (formerly RSVP). This wonderful group of folks in all 3 Delaware counties set up collection boxes at many locations for our project. So many wonderful volunteers made a tremendous amount of donations. It was such an important part of the project. 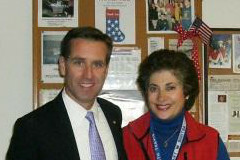 In addition, we had so many wonderful Sussex Country residents who worked so hard for our troops. Special THANKS to Marianne & Carl Sheran for spearheading so many collection drives, Jane Starr and the Village Improvement Association of Rehoboth Beach and Maureen Walker and the Millville-By-The-Sea Community for all their fabulous donations as well as so many new friends who helped us so much. 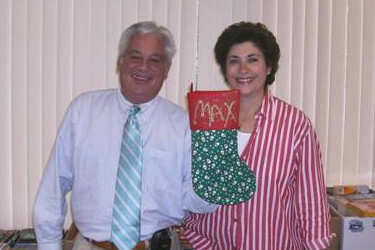 We received over 10,000 beautifully home sewn stockings. We received over 400 beautifully hand knitted hats. We received over 10,000 personal greeting cards to go with each stocking. 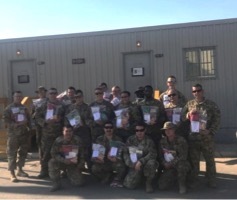 We received over 800 letters of support for the troops from school children. We received over 10,000 lip balms from Chapstick/Pfizer Corp.
We received over 10,000 packets of "Snowman's Soup" (hot cocoa). We received over 10,000 decks of playing cards from Caesar's Casino in Atlantic City, NJ. 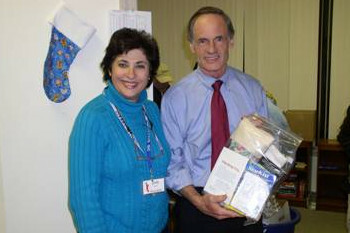 We received over 10,000 Ziploc bags to mail our stockings from The Castle Bag Company. We received thousands of toothbrushes, toothpaste from our great Dental community. Special thanks to Benco Dental, Carla Rawheiser and Progressive Dental, Patterson Dental Supplies, Oral Healthcare of DE, Alpine and Raffeto, Dr. Ben Parenti, and many, many dental offices. We received great assistance from our printing community. Special thanks to Kathie Simmons, Dawn Doherty, Steve Donze of Brandywine Drumlabels, and Kevin Dempsey of Sprint Quality Printing Inc.
We received over 10,000 paperback books from the Friends of Hockessin Library, Avon Grove Lions Club, Kennett Square Resale Book Shop, All Around Books, many friends in Lewes, DE, Foxfield Residents and many others. 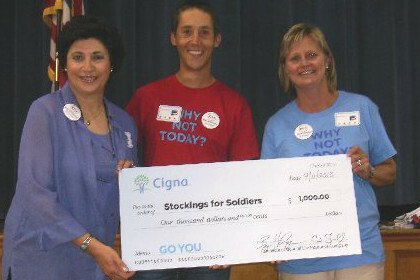 We received over 7,400 Star Packs for some of our troops from Annette Long, Lorraine Fecondo & family. 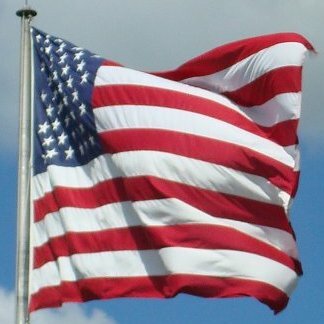 We thank the Holy Rosary Boy Scout Troop 61 for the proper disposal of the U.S. flags that cannot be flown anymore. See our website for more information on helping us to make our Star Packs. We received 4,000 ballpoint pens from the Eastern Pen Supply Company. Our most sincere thanks to Mr. 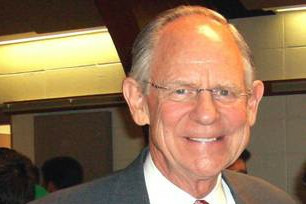 Bud Lauck. We received over 3,000 lbs. of Halloween candy from Dr. Ron Briglia, Dr. Constance Greeley & many other wonderful local dentists. 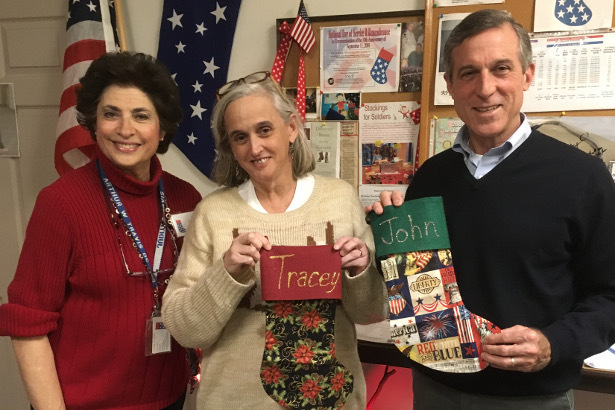 We received 500 beautiful homemade stockings from our great friends at Cokesbury Village with the wonderful leadership of Edna Hein and Jane Kipp, and we welcome their new Team Leaders Ginni and Marian. We received tons of donated items and extra funds from all the great students and staff from the Washington Township Schools in Sewell, NJ and the great leadership of Lauren, Krista, and Bernadette. We received many tons of donated items from our great friends at Delaware Volunteers 50+ (formerly RSVP) from Sussex County, Kent County and New Castle County. Thank You to Ann Gorrin, Linda, Danielle, Sheri, Norma Testa and all their great Assistant Elves for their invaluable assistance. We received over 45,500 pounds of goodies from many, many schools, churches, synagogues, community groups, exercise groups, senior centers, Libraries, Rotary Clubs, Girl Scouts, Boy Scouts, and many new friends from all over the U.S.
Special Thanks to Mark Stentz and the Trash Tech Company for letting us use their great Recycling container during the project. We filled it so many times. It was essential to our project. 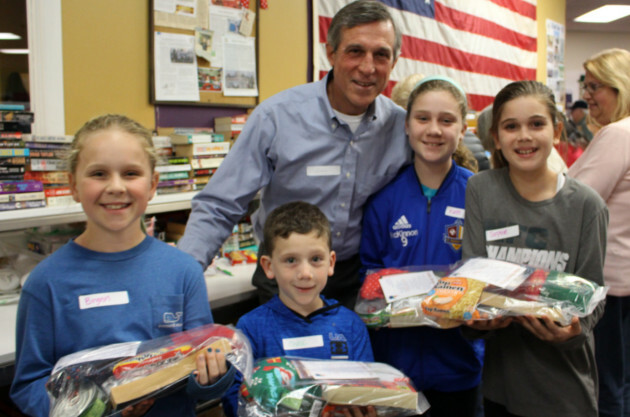 We enjoyed working with over 1,000+ volunteers who came by to help us at our Stocking Store. Special Thanks to Paul Cummings and the Del Monte Company for bringing us 1,500 empty apple boxes, which allowed us to mail our stockings. Special Thanks to the WestRock Company for always bringing us their great Corn Flakes boxes. Such great friends!!! 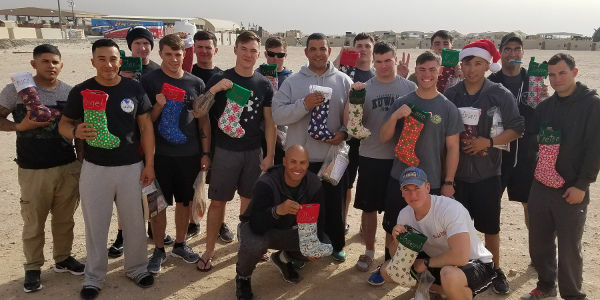 Special Thanks to the wonderful members of the American Legion Post #18 who took care of the Packing of the stockings into the boxes every night. Thank You Lyman, Peter, Lisa, Jane, Jack, Tom and all their team. Special Thanks to Bank of America for all their wonderful contributions and donations. Especially to Barbara J. Oliphant, Damodar, Anand, Janeen Yeager, and their great BOA associates for donating 3,300 packets of Snowman Soup. So great!!! Special Thanks to so many students who wrote such sweet and thoughtful letters to our troops. So many students helped but a special Thank you to the students and staff of Lancashire Elementary and our great friend Susie Murdock for her leadership. We processed our 1,400 boxes on-line in 5 days, Very Special Thanks to Sam Youse and his great I.T. Team including Jon Stewart, Donna Pelletier, Sharon Hodgson and great volunteers. Super Special Thanks to Mr. Fred Smith, President of FedEx and his wonderful Team of Heather and Hillary for sending us a FedEx truck to carry our 1,400 boxes to Chicago. We ran into a postage problem if we mailed our boxes from Delaware, so we sent our boxes directly to the APO post office in Chicago. We are so very grateful for their kindness and great assistance. THANKS to Walter, their great FedEx driver. THANKS also to Matt P., Tyler and Brenda E. at the Post Office in Chicago who took excellent care of our boxes when they arrived! THANK YOU to our Delaware Post Office friends, Vaughn, Jamie, Al, Gib and their great Team for helping us for all the years that we worked together. THANK YOU to the great folks at Endicia.com who took such great care of us and helped with our Custom Form procedures. Thanks to David W. and Alan B. We’re very grateful. Special Thanks to Lorree, Ed, Tom, Rowan University's Automotive Engineers and their volunteers for helping to organize and load the FedEx truck and to those friends who closed up the boxes and carried them to the waiting truck. A special Thank You to Bumpers & Company, John Mager and Doug Kook, our wonderful accountants who help us to maintain our 501.c.3 nonprofit Delaware corporation status. 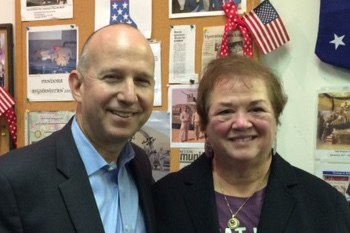 Thanks also to Cathy Morgan, our great bookkeeper. A special Thank You to the The LOFT/Ann Taylor store in Concord Mall for donating their fabulous furniture to us when they closed that one store. Thank You to Good 360 for making the arrangements for us to acquire the furniture. And A Special THANK YOU to Howard A. from Stony Brook Sew & Vac in Fairfax who donated so much furniture to us. We greatly appreciate it so much. Thank You to Renee H. for creating such a cute outfit for our SFS Mannequin..
A Very Special Thanks to all the volunteers who came over each night to lend a hand. We couldn't accomplish all we did without everyone's great help. We can't say THANK YOU enough. doing so much for the military. We are a CH-47 Helicopter unit from Savannah, GA.
Hugs and Smiles to our troops deployed all over the world, proudly representing America. They all know that it is not about candy, cookies or Beanie Babies, it’s about what’s in your hearts. Thank You, everyone, for all your continued support. 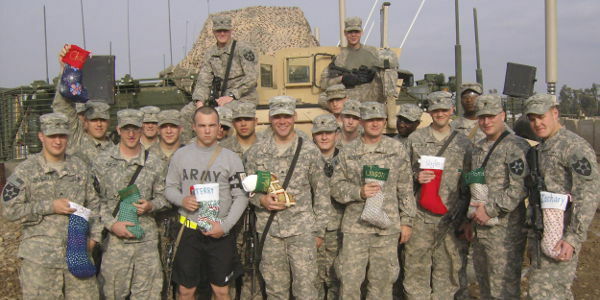 STOCKINGS FOR SOLDIERS - Delaware, Inc. Your stockings are sooo beautiful!!! 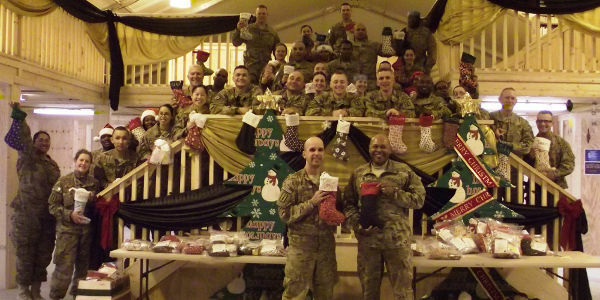 But please reduce the number of stockings sent to us because we have so many stockings leftover to be used next year. Oct. 1th to Oct. 31st 2019. Any stockings received after Oct. 31st will have to be stored for the following year. We hope you all will remember to follow our request to make the finished stockings 15" high by 9" wide, using only cotton fabric and only plain felt for the cuff, so they can fit into a 2 gallon ziplock bag. 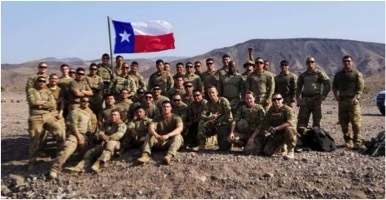 We will be sending support to our troops as long as they are deployed in Service to America. 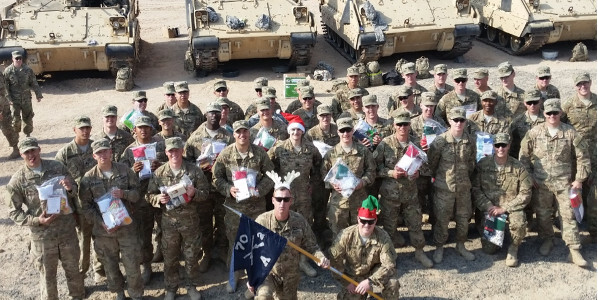 And we hope you will remember, for some of these troops, our personalized stockings will be the only gift they will receive for Christmas. This special photo was received a few years ago. 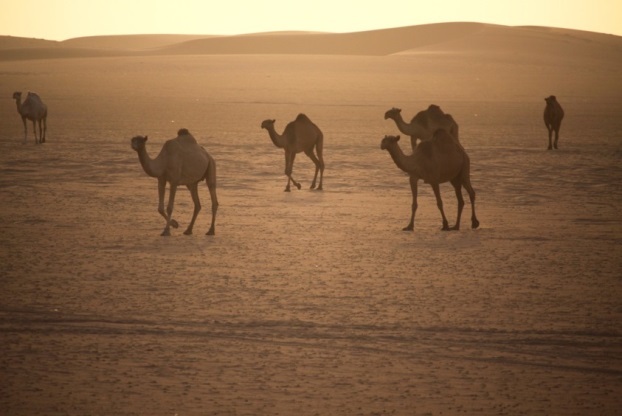 I keep wondering, where are the camels going??? We would not be successful without the support of the business community and individuals.